Color(s): White and red, orange and white. The red or orange typically present in patches. The ears are tipped in black and the face is white blazed. This rare breed originated in the Netherlands in the 1500s. Kooikerhondje's were used to decoy and hunt ducks. 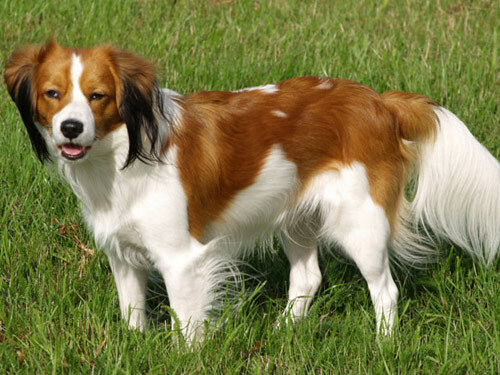 After World War II the Kooikerhondje became nearly extinct. In 1943 Baroness von Hardenbrock van Ammerstol began the arduous task of reviving this breed. Today they remain extremely rare and difficult to obtain. Seldom seen outside the Netherlands, the Kooikerhondje is a medium sized dog that has the appearance of a Spaniel or Setter. They are brave, versatile, and alert. The Kooikerhondje breed is highly adept at flushing and retrieving fowl. The Kooikerhondje breed is lively, attentive, and good-natured. They are not recommended for homes with small or loud, boisterous children. They bond closely to their family and are reserved with strangers. The Kooikerhondje will do well with other pets they have been raised with. They make an excellent hunting companion or delightful family pet. Kooikerhondje's require occasional brushing. Bathing should only be done when absolutely necessary. It is important to regularly check and clean the ears. They are prone to such health issues as Epilepsy, Von Willebrand Disease, Eye Disorders, Patella Luxation, and Myelopathy. The Kooikerhondje is a double coat breed. The outer coat is water-proof, medium to long in length, sleek, and slightly wavy. The tail is bushy and there is feathering on the backs of legs, chest, and ears. The under coat is short and dense. The Kooikerhondje is exceedingly sensitive and does not respond to loud, harsh, or heavy-handed methods. Training must be done with kindness, fairness, patience, and consistency. The Kooikerhondje breed is not recommended for apartment or city dwelling. They thrive on physical activity and do best in a rural setting with ample opportunity to run, roam, and hunt.